Before their daughters grow up and leave home, mothers may impart some lessons in the womanly arts—for example, the proper way to whoop and hoot with your mate while sitting in a tree branch. 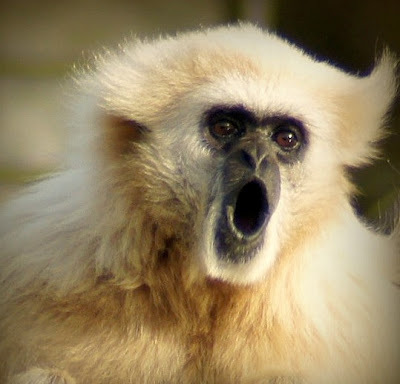 As an adult, a female gibbon sings elaborate duets with her male partner. But before she leaves the family, her mother seems to take responsibility for the daughter's vocal lessons. Young gibbons spend many years learning to vocalize like adults. By age six or so, "sub-adult" apes can match the vocal prowess of a grownup. Mothers and daughters often sing at the same time, though it's not clear why. Researchers traveled into the rainforests of Sumatra to make audio recordings of gibbon families and try to figure out whether these sing-alongs are significant. Lead author Hiroki Koda of Kyoto University and his colleagues studied six families of agile gibbons (that's a species name, not just a descriptor). Koda explains that gibbons are monogamous, and male and female young grow up with their parents before departing the group to find their own partners. Each family in the study included a nearly adult daughter, and the researchers captured recordings of these daughters and their mothers singing together. They found that some daughter gibbons were better than others at singing in sync with their mothers. They were also better at matching their mothers' tunes. But these talented daughters actually duetted with their mothers less often. Koda thinks that's because the ones who "showed more skillful songs" are the most mature, and are nearly ready to leave home. Daughters who still need the practice sing with their mothers more often. The researchers also found that mothers who sing more often with their daughters—the ones who are still giving lessons—modify their own songs more when they do so. Koda says this may be similar to the "motherese" that humans speak to their babies. Like human moms talking slowly and at a high pitch, gibbon moms alter their vocalizations when duetting with their daughters. Koda says that in the past, primate calls have been seen as "completely different from human language development." Rather than learning from their parents, young monkeys and apes seem to figure out their calls on their own. But this is the first evidence of mothers helping offspring learn to vocalize in gibbons—or any other nonhuman primate. 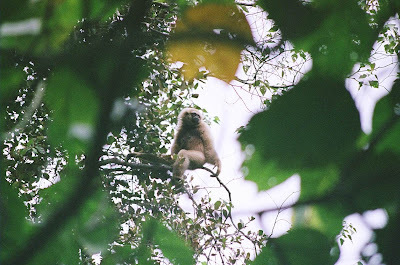 Images: Top, singing gibbon by patries71, via Flickr (not, as far as I know, the study species). Bottom, a mother gibbon from the study by Hiroki Koda. The "for future mates" part is a guess, isn't it? What if they just like to sing with each other?